In addition to writing sports articles, movie reviews, and now editorials for Skid News, I am also the co-founder (along with Nick Fronte, another Skidmore student) of the website Check Down Sports. Our goal at Check Down is to present you- the sports fan- with the most insightful, bold, and heartfelt takes on the hottest storylines in sports. Check out our site, if you haven't already, and enjoy the latest edition of "The Sunday Recap," a weekly column dedicated to my thoughts on the previous day’s NFL action. Here are my big takeaways from last week's games. Thanks to their 24-7 win over the Rams, the Vikings now own victories over both Los Angeles and New Orleans, the latter of which Minnesota beat 29-19 in Week One. Each of those teams are the Vikings’ main competition for a first-round bye — and based on how thoroughly they have beaten both of those teams, it is getting likelier by the week that the Vikings will not only reach the NFC Championship, but become the first team to ever play a Super Bowl in their home stadium. He’s obviously not in the same league as Antonio Brown, Odell Beckham, and co. But Adam Thielen is clearly one of the ten best receivers in football. He just had his sixth game this season in which he recorded over 95 receiving yards — and his 916 yards on the season are now the second most in football. He also had one of the top highlights of the day yesterday with his impressive 65-yard catch-and-run to put the Vikings up 21-7 that effectively sealed the game. Actually, more that I think about it, Thielen’s not quite in the top ten. But he’s still having a phenomenal year! Good job New York: you just bounced back after losing to the previously winless 49ers and beat one of the better teams in the AFC without allowing a single touchdown! But where was this kind of effort over the past month? Based on how dominant the Giants were on the defensive side of the ball, clearly they’re not as bad as their 2-8 record indicates. That should make Giants fans feel even more frustrated, though, because it makes you wonder how a team labeled as dark-horse Super Bowl contender in the preseason could fail so miserably. Well, obviously. KC just lost to a Giants team that appeared to have already given up on their season. With four losses in their previous five games, the Chiefs clearly are not the Super Bowl contenders they were projected to be after a 5-0 start. But I still wouldn’t give up on them just yet. I still like their personnel on the offensive side of the ball. Plus, it’s not like the AFC is particularly strong. I’m not ruling selling Chiefs’ playoff stock just yet. 6. Also, what was up with all of those trick passes? I think he launched that thing 57 yards. New Orleans really had no business beating the Redskins yesterday. Washington’s offense was dominant all day long: Kirk Cousins threw for 322 yards and three touchdowns; rookie running back Samaje Perine had 117 yards on the ground. Nonetheless, the Saints found a way to come back. Great teams find a way to win, what else can you say? And what an important win for New Orleans. Not only did it keep its winning-streak alive, but it maintained its one game lead over a 7-3 Carolina team that continues to apply pressure in the NFC South. No team should get too much credit for shutting out an offense led by Brett Hundley. But the fact is this: Baltimore has now posted three shutouts on the season. John Harbaugh’s squad is currently the sixth seed in the AFC, so somehow the Ravens may be able to overcome arguably the league’s worst offense and make the playoffs. It shouldn’t be all too surprising, though, considering how good their defense has played this season. LA Chargers (4-6): Little surprised? Don’t be. LA has the best quarterback of the bunch and an absolutely terrific pass rush. Even though they are currently in 12th place due to tiebreakers, they’re still only one game behind Baltimore for sixth place. I can envision them leap-frogging everybody. Tennessee (6-4): The Titans aren’t great, but they play in a pretty weak division. They should win enough games to make the playoffs. Baltimore (5-5): Great defense, really bad offense. Oakland (4-6): On a good day, Oakland is one of the six best teams in the AFC…on a good day. New York (4-6): If the Jets make the playoffs, Todd Bowles should win Coach of the Year. It isn’t impossible, either. Houston (4-6): Too bad Watson got injured. The Texans will contend for a Super Bowl as early as next year assuming he comes back healthy. Cincinnati (4-6): The Bengals have A.J. Green. That’s about it. Miami (4-6): I don’t know if there is anything positive to say about Miami. Buffalo (5-5): The Bills have been the worst team in the NFL over the past three weeks. The Bills entered their game against the Chargers as the sixth seed in the AFC. For head coach Sean McDermott to make a dramatic change at quarterback at such a crucial point in the season and then have that happen — that, as in, have the quarterback you picked to replace the competent Tyrod Taylor throw five first half interceptions — is inexcusable. In the English Premier League, coaches will literally get fired if their team underperforms even after they win a title (i.e. Claudio Ranieri, Leicester City). It’s not an overreaction to fire a coach like McDermott who arguably cost his team a playoff berth by making such a terrible decision. Few New England victories over the past few years have been as dominant as the one yesterday. 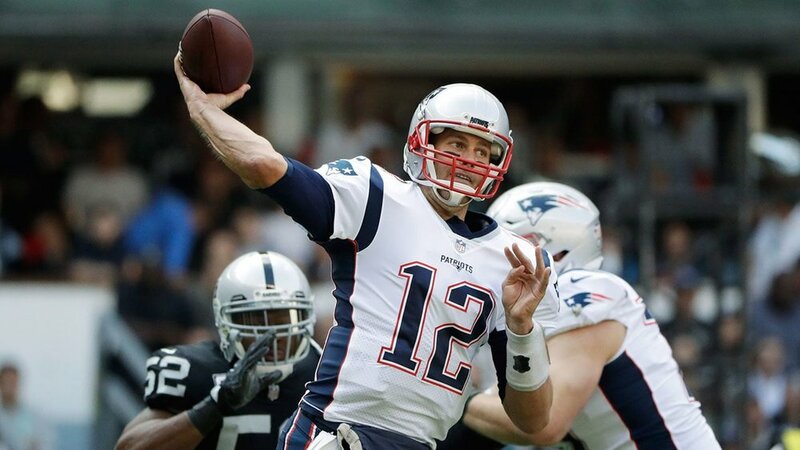 It obviously helped that the Raiders laid an egg, as they made way too many careless mistakes, none bigger than the Seth Roberts fumble on the Patriots’ five-yard line while the game was still competitive. But once again, the Pats made another opponent look like a JV team. The offense scored on seven of its eight meaningful drives; the defense held its sixth consecutive opponent to under eighteen points; and the special teams had arguably the play of the day thanks to Stephen Gostkowski’s unbelievable 62-yard field goal. Best team in the NFL? I think so. I’ve championed the Patriots as the best team in the NFL for the past few weeks, but it is hard to argue against Philadelphia, who notched their sixth win by 10+ points in its 37-9 win over Dallas. 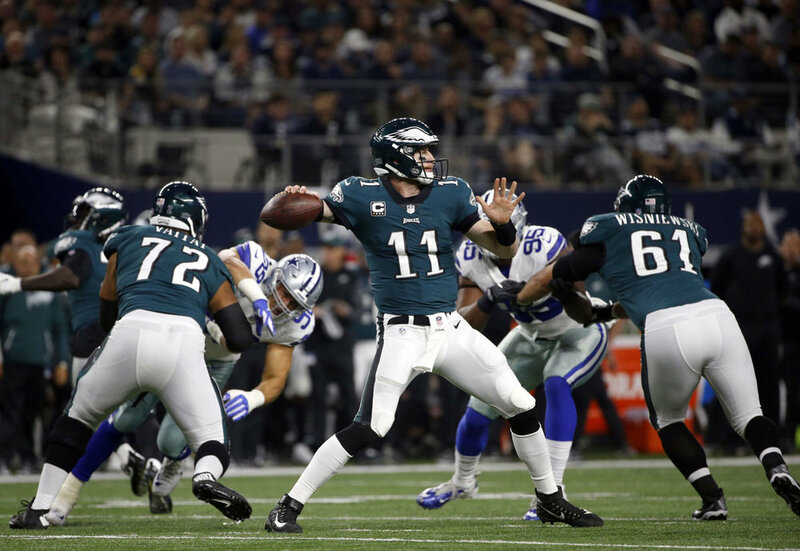 The Eagles clearly do a variety of things well; and with the exception of the Patriots, as well as maybe the Saints and Rams, there is no team in the NFL that can overwhelm an opponent quite like Philly, who outscored the Cowboys 30-0 in the second half after trailing at halftime. The Super Bowl hype is legitimate. The former posted his highest Total QBR of the season (95.5) in an incredibly efficient performance against Oakland. The latter added to his league-leading touchdown mark by adding two for a total of 25. Due to Kansas City’s recent struggles, we can now officially rule out Alex Smith as a candidate for MVP. And since no running back or wide receiver is having a historic season, the MVP award has officially become a two-horse race. So Brady has the edge in every statistical category with the exception of touchdown passes. I’d argue he has also been more clutch as well. Brady had that epic game-winning drive against Houston, for instance. Wentz hasn’t had a clutch moment like that so far. And let’s not forget that Brady has had to overcome one of the worst defenses (at least statistically) in the NFL, as the Patriots technically measure as the 32nd ranked defense in terms of yards allowed and 13th best in terms of scoring. Philadelphia, on the other hand, ranks 7th and 8th respectively in those categories. Oh, and did I mention that Brady has not had his most trusted receiver, Julian Edelman, as well as another top target from last year’s Super Bowl, Malcolm Mitchell, for the whole season? Simply put, Brady is the MVP if the season ended today. He should be the MVP by the time the regular season ends, too. However, I have a feeling that the media would rather honor a rising star like Wentz as opposed to a two-time MVP like Brady, provided things remain relatively equal.